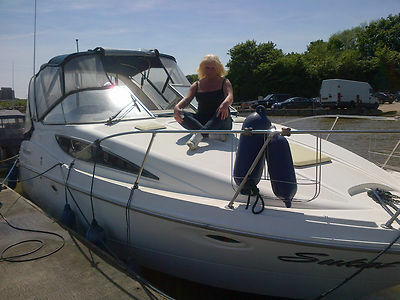 For sale is our much loved Bayliner 2855. Immaculate interior with flat screen tv, dvd player & Freeview, Microwave, air conditioning and all the features and layout that makes this boat the best in it’s class by far, including 6 berths, separate cabin and shower room / toilet. Loads of extras, including tender. Engine (7.4 Mercruiser), outdrive and sea toilet just serviced, new batteries and impeller. Recent replacement manifolds and risers, outdrive replaced with much more serviceable Bravo 2. Antifouled and anodes at Easter every year. High end colour Garmin with sea charts included. Very very low hours, engine starts and runs beautifully, and pulls like a train. Moored Medway (really good affordable mooring: could be taken over)…hate to see her go, but no time to get the best out of this lovely boat…in 5 years we’ll buy another! Note this is the new shape Bayliner without the dolphin nose and with much better build quality. SOLD WITH FULL PROFESSIONAL SURVEY. Priced very competitively (check prices of similar post 2000 boats) for quick sale to a good home. Loads more pics on request….thanks for looking. Any enquiries, 01304 824194.